I know that probably the only reason this touched me so much is that I’m sleep deprived from too many 3:30 a.m. wake-ups for early flights BUT I just had to share this picture. 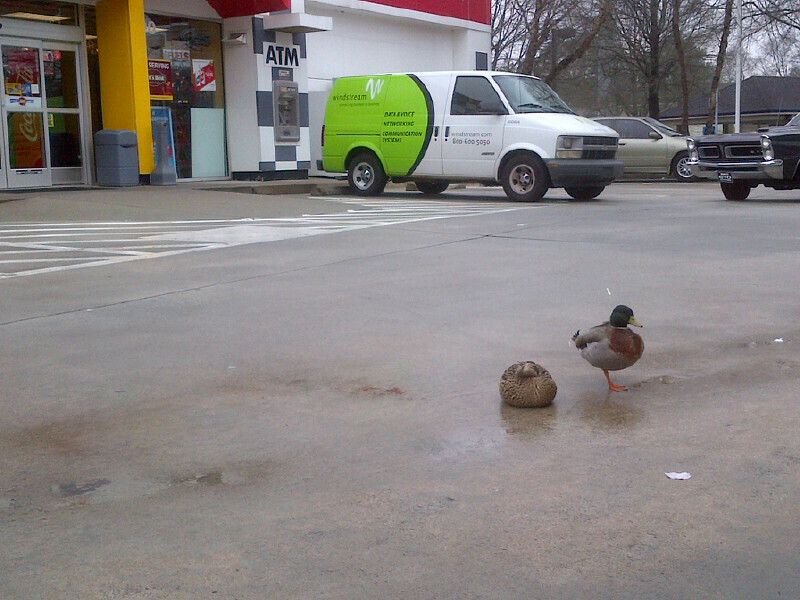 I drove into a busy gas station this morning and saw this husband duck hovering protectively over his wife, who was sitting in the middle of the parking lot, right in the busiest corridor by the gas pumps, with her head tucked under her wing. When a car zoomed in, inches away, she would get up, waddle a few inches, and sit back down. Clearly injured in some way. And he would waddle protectively next to her, never leaving her side, despite the danger they both were in. I watched them for five minutes, and honestly found myself tearing up (I told you I am sleep deprived) as this husband duck did exactly what God has designed husbands to do: shepherded his wife through dangers, never leaving her side, being there for her when she is hurt or tired or unable to move forward but a few inches at a time. I’m coming home from a very draining trip, after weeks of some exhausting deadlines and late nights and early mornings. And my amazing husband has told me repeatedly he is going to be watching over me this weekend to be sure I don’t work too much, and get rest. He is there for me when I am hurt or tired or unable to move forward but a few inches at a time. It’s what all men want to be. Here’s to the husband ducks among us.